Life lessons are easy to learn at The Grand Canyon. | Chuc Chimes In: Today's latest tips to make your minutes count! « Want to waste a lot of time? Here’s a common time-wasting question. Life lessons are easy to learn at The Grand Canyon. Please permit me to explain each item in greater detail. My son, Brett, along with his wife Amy, my granddaughters Sophie and Abby, and my son Scott, PLANNED to hike several miles down Bright Angel Trail. I pointed out in a previous post that my sons and I had done this before and we wanted to share the rich experience with my granddaughters. We all knew that the trails would be steep so we all PREPARED by exercising for many weeks in advance of the hike. It can get very hot at the canyon (You are in a desert) so we specifically SCHEDULED our hike on Memorial Day weekend in order to be ahead of the hot summer temperatures. Look carefully at the above photo and you might see the straps on my shoulders, which held a pack on my back that contained food, water, and medical supplies (PRIORITIZING). Each one of us carried our own pack of supplies. Clearly, I couldn’t take the above photo myself. 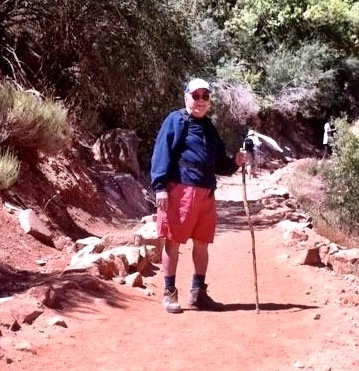 My son, Brett shot the photo (TEAMWORK) when we were one and ½ miles down Bright Angel Trail from the rim. Thank you, Brett. As for ELIMINATE, I would love to have carried my laptop, binoculars, etc., yet we knew that climbing back up the trail is very difficult so each of us ELIMINATED items we would like to have carried with us so we could enjoy the experience, rather than worry about distractions and excess items. Now please consider this: I suggest that the lessons I’m describing are not just Grand Canyon considerations. They are life lessons too. Disagree with me if you want, but by planning, preparing, scheduling, eliminating, and teaming, we were able to watch not just each specific step, but more importantly we could admire and gasp at the awe-inspiring ever-changing beauty of The Grand Canyon itself. Best of all, we were able to create a memorable experience for each one of us. After all, isn’t creating memorable experiences—experiences that last–for family, friends, customers, and associates the ultimate value of time? I propose that time passes, yet experiences and memories last! This entry was posted on June 24, 2012 at 7:36 pm and is filed under Balance, Management, Organize, Planning, Self-management, Teamwork, Time management, Time management/Self-management. You can follow any responses to this entry through the RSS 2.0 feed. You can leave a response, or trackback from your own site.